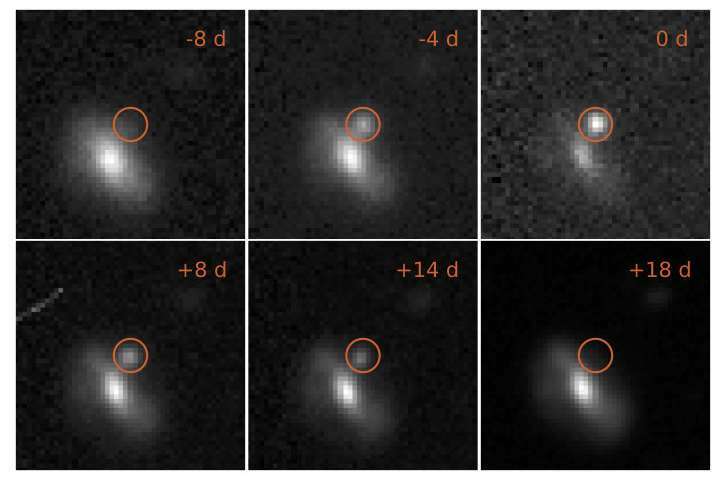 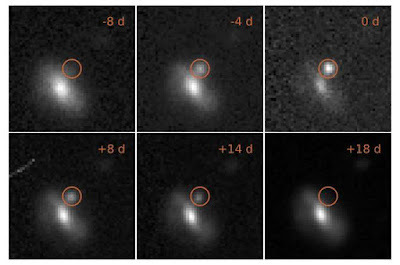 Astronomers find 72 bright and fast explosions: BLACK HOLE SPLITTERS? 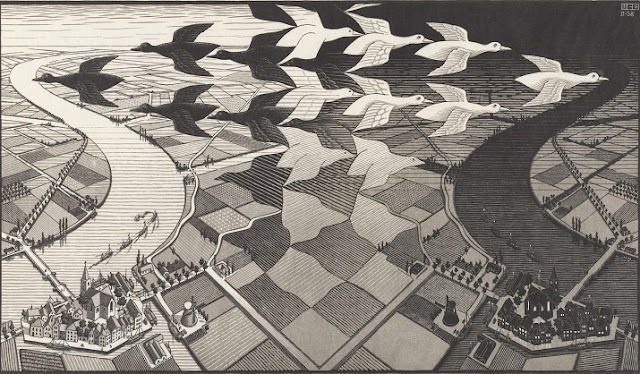 Was MC Escher creating a symmetrical copy multiverse like Quantum FFF Theory?? 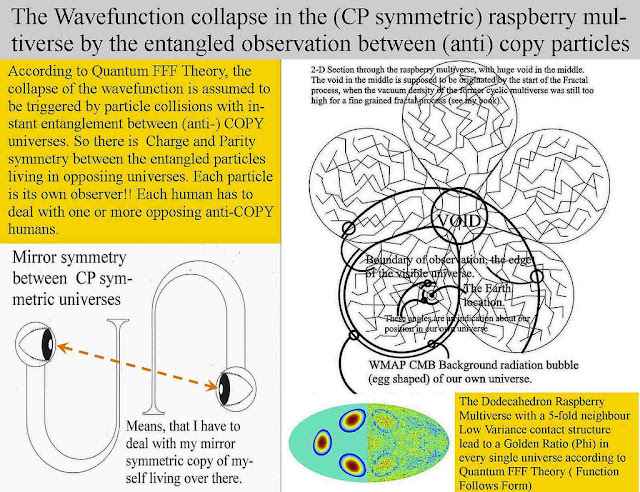 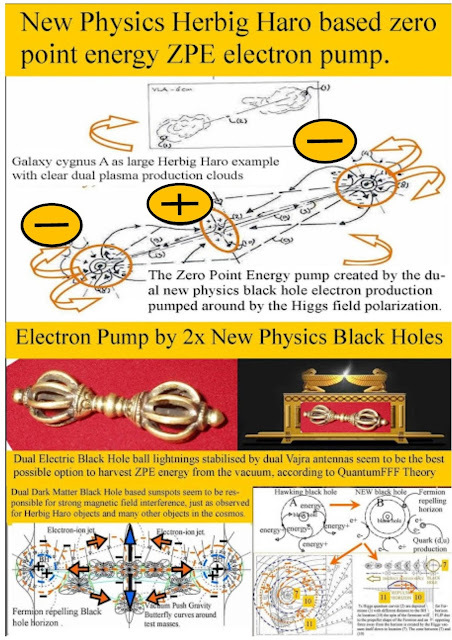 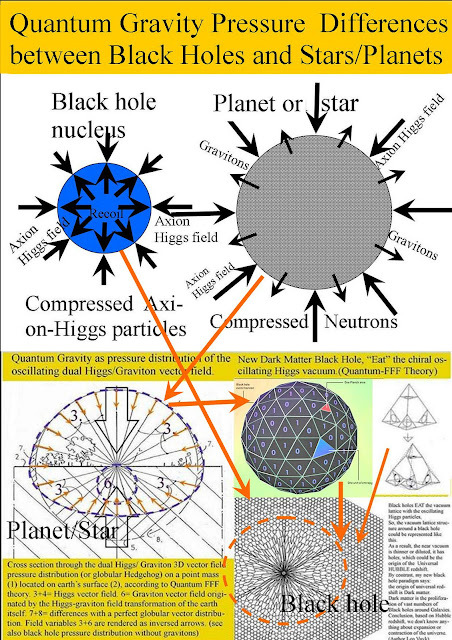 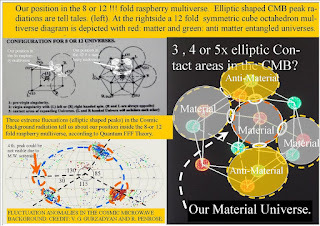 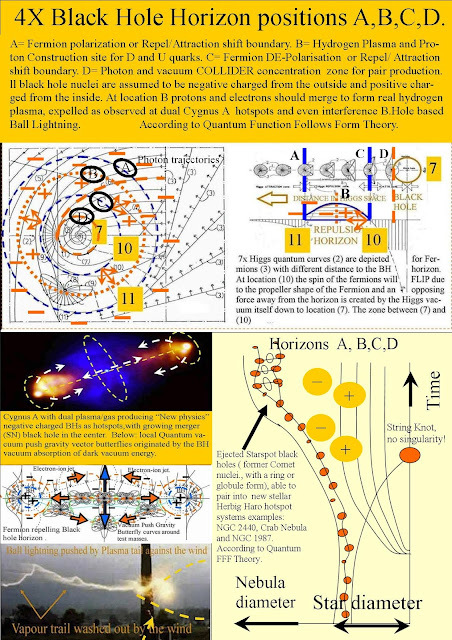 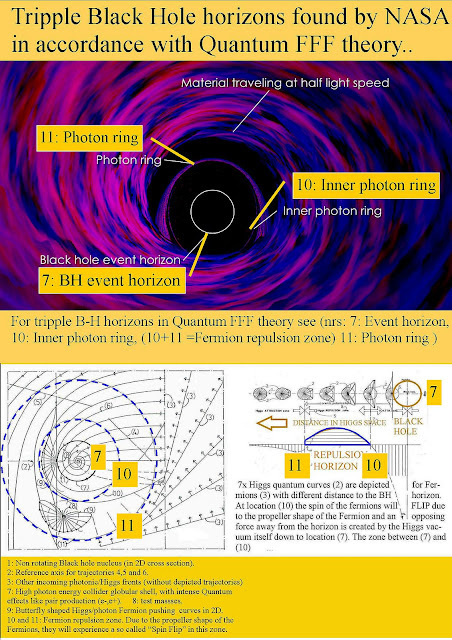 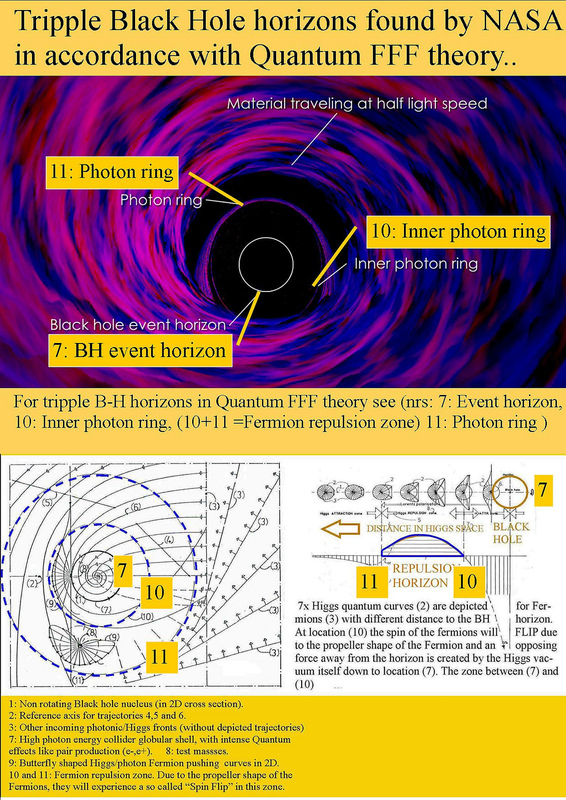 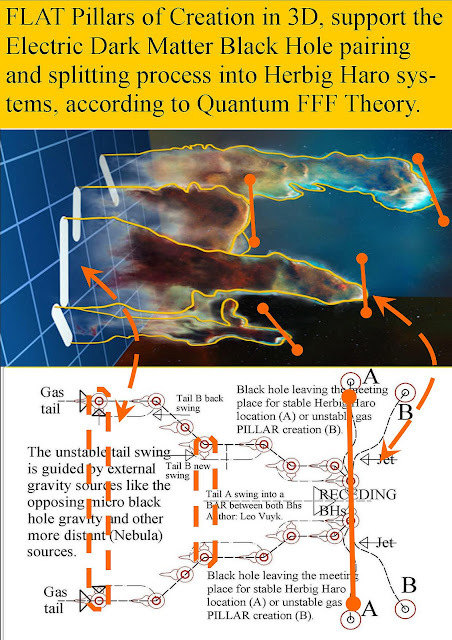 OR: ZPE Zero Point Energy examples around black holes. 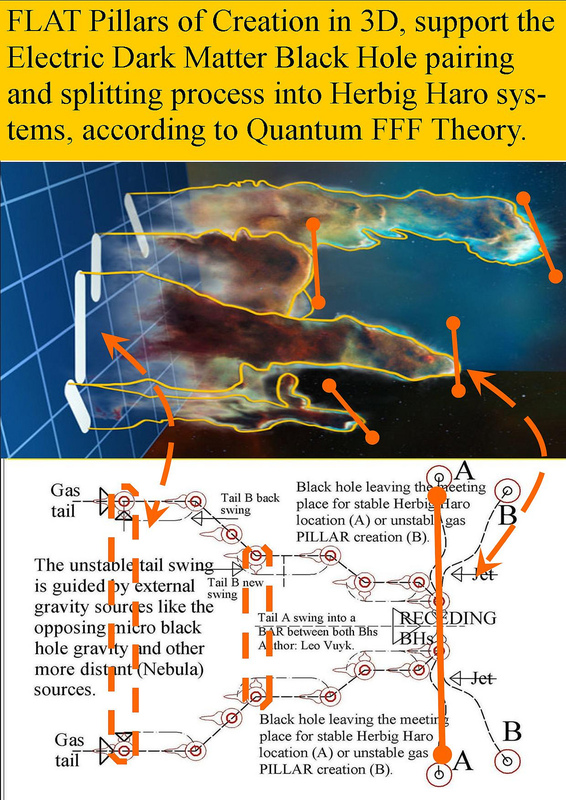 Abstract, FUNCTION FOLLOWS FORM in Quantum FFF THEORY. 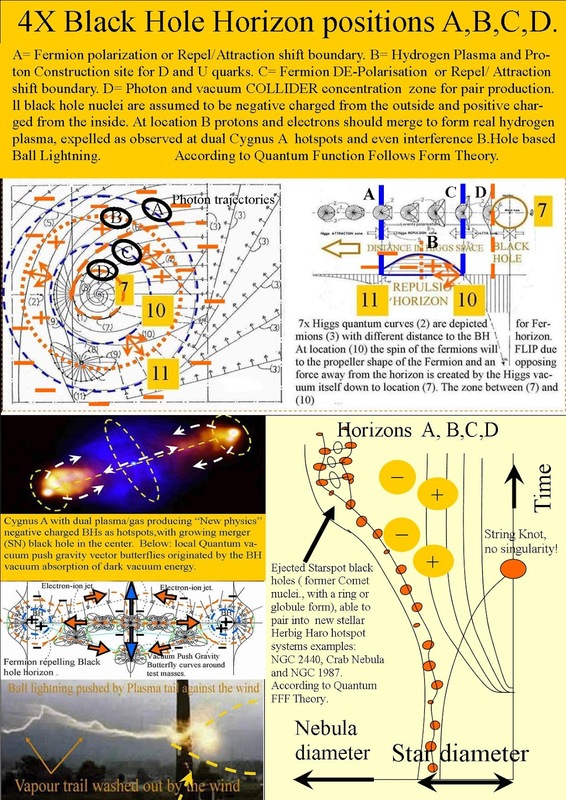 The FORM and MICROSTRUCTURE of elementary particles, is supposed to be the origin of FUNCTIONAL differences between Higgs- Graviton- Photon- and Fermion particles. 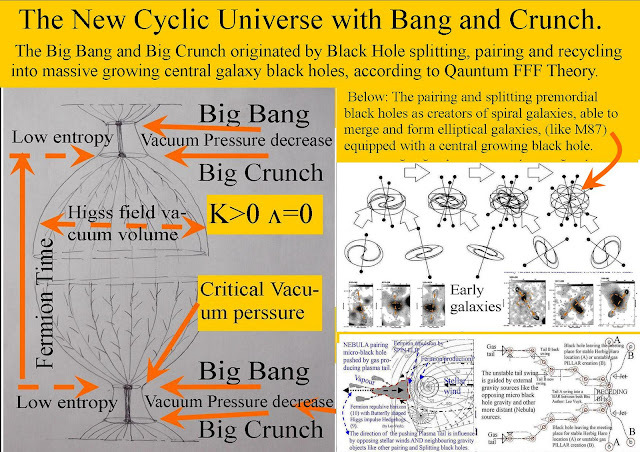 As a consequence, a NEW splitting, accelerating and pairing MASSLESS BLACK HOLE, able to convert vacuum energy (ZPE) into real energy by entropy decrease, seems to be able to explain quick Galaxy- and Star formation, down to Sunspots, Comets and even Ball Lightning. See also: Wikipedia on Tom van Flandern in: a limitless source of free energy. 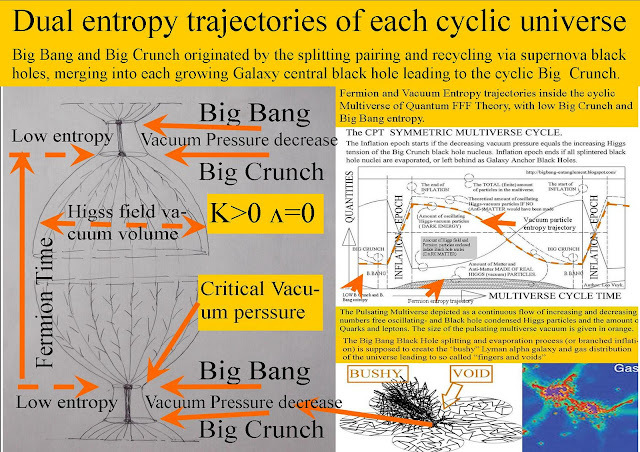 Van Flandern supported Le Sage's discredited theory of gravitation, according to which gravity is the result of a flux of invisible "ultra-mundane corpuscles" impinging on all objects from all directions at superluminal speeds. 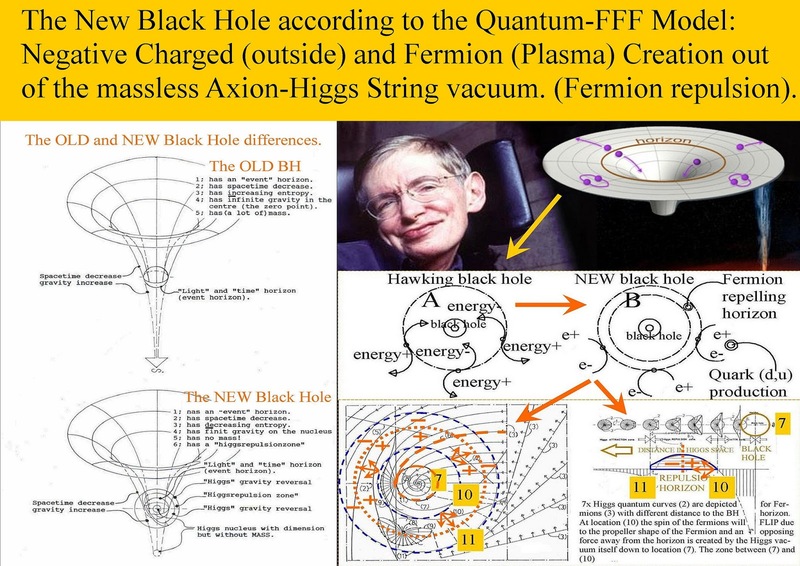 He gave public lectures in which he claimed that these particles could be used as a limitless source of free energy, and to provide superluminal propulsion for spacecraft. 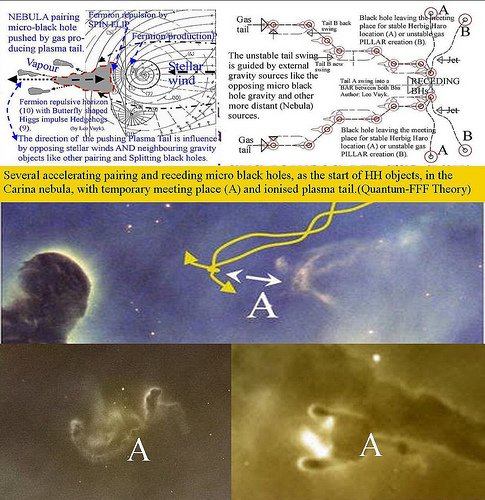 He also speculated that the ultra-mundane flux caused the explosion of a major planet once located between Mars and Jupiter. 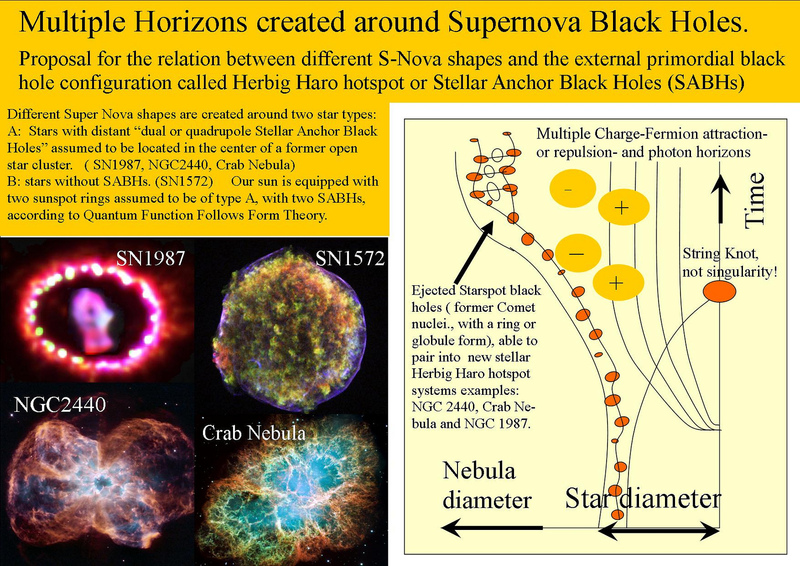 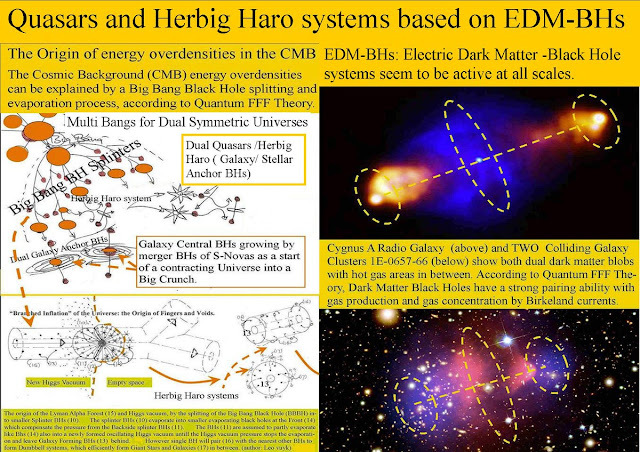 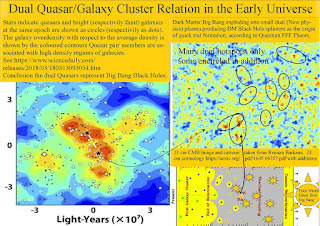 Herbig Haro Object Mystery Solved by Dual/Triple New Physics Dark Matter Black Hole Pairing, the Origin of Quick Star/Galaxy Formation. 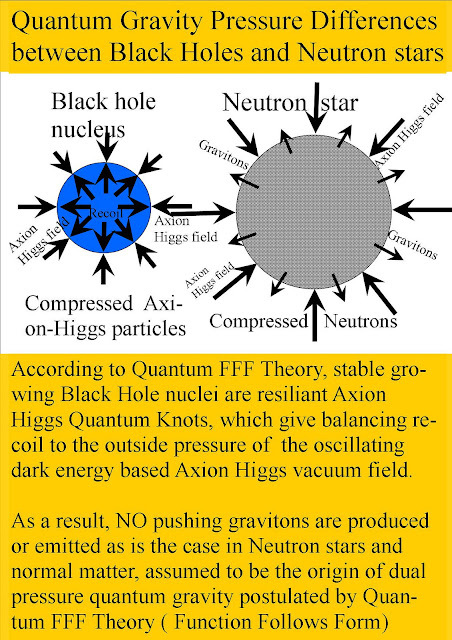 The rigid FORM and Microstructure of elementary particles (rigid strings), is supposed to be the origin of functional differences between Higgs- Graviton- Photon- and Fermion particles. 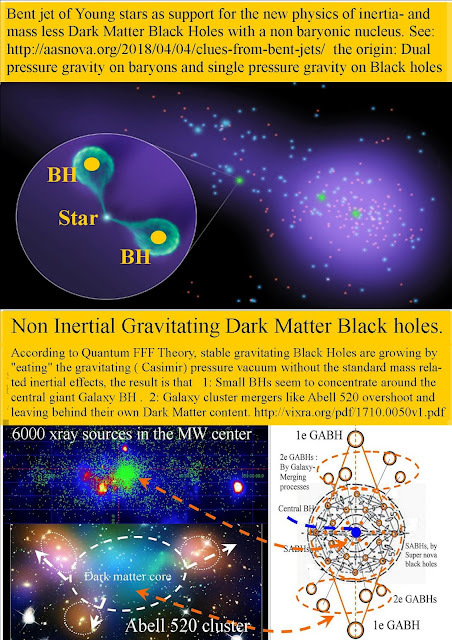 As a consequence, a new splitting, accelerating and pairing new paradigm Dark Matter Black Hole, (DMBH) seem to be able to convert vacuum particle energy (ZPE) into real plasma which could explain quick Galaxy- and Star formation, by so called Galaxy- or Stellar Anchor Black Holes (GABHs respectively SABHs). 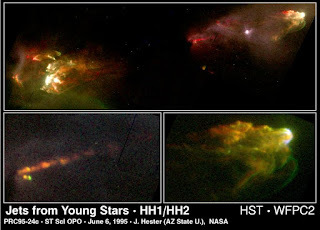 These Anchor Black Holes can be observed as Herbig Haro ( HH) Hotspots or Bowshocks. 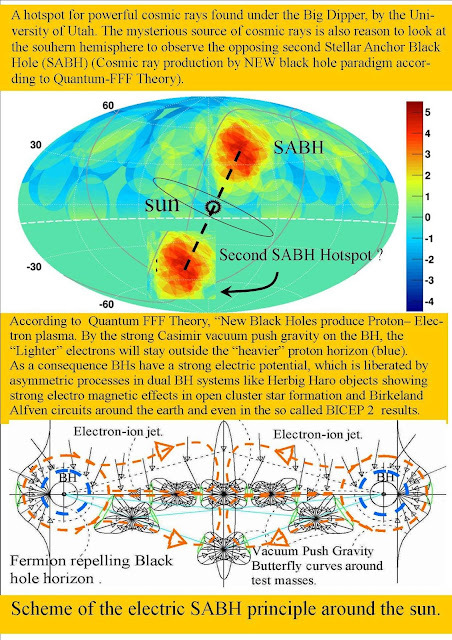 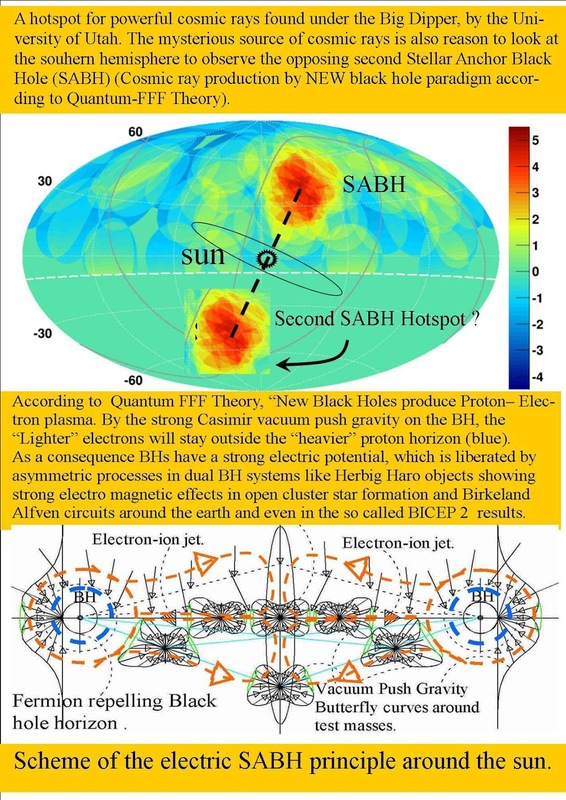 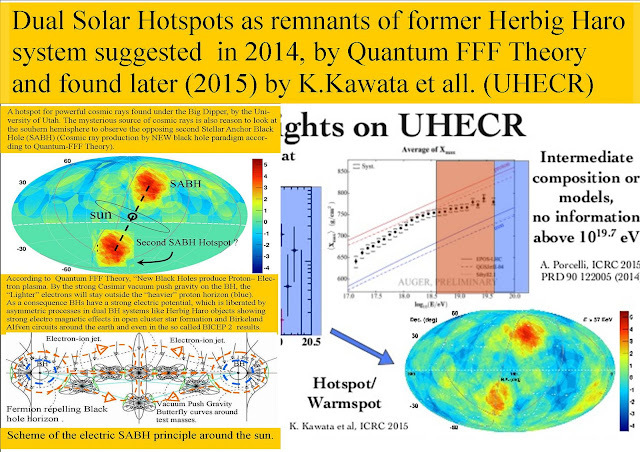 Recent observation of two High Energy Cosmic Ray Hotspots, (HECRHs) at solar polar locations, ( Big Dipper and Southern cross) is reason to assume in accord with new physics of Quantum FFF Theory, that these hotspots represents the locations of our Solar Anchor Black Hole (the North-and South SABHs). 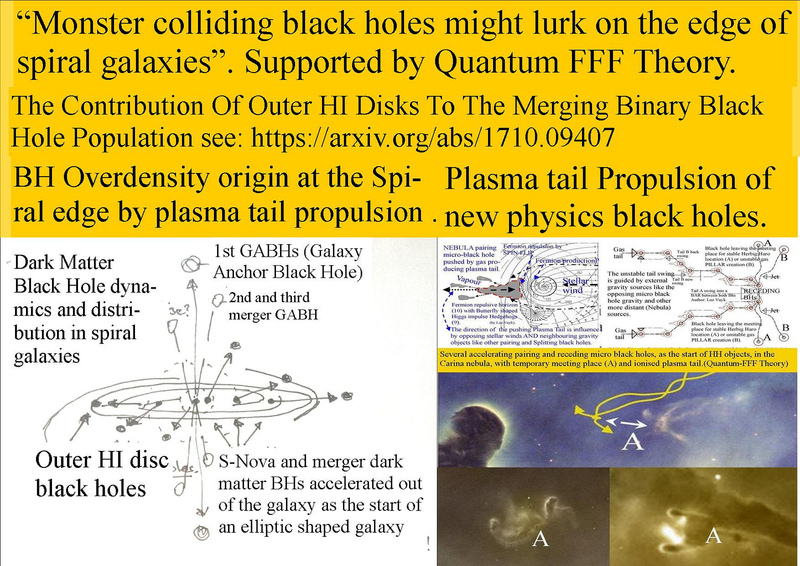 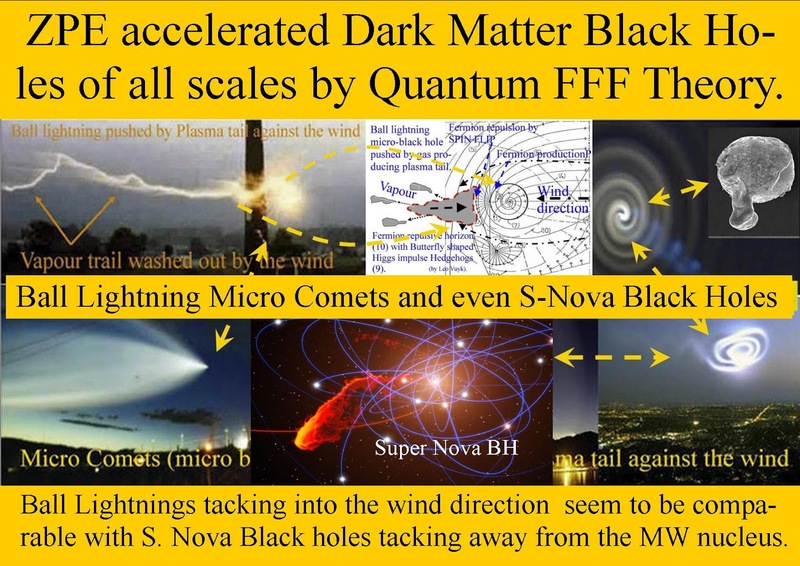 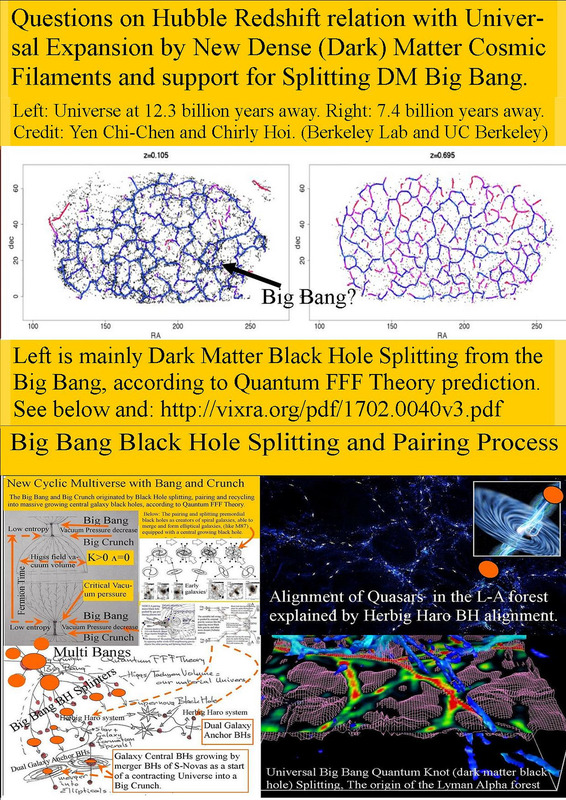 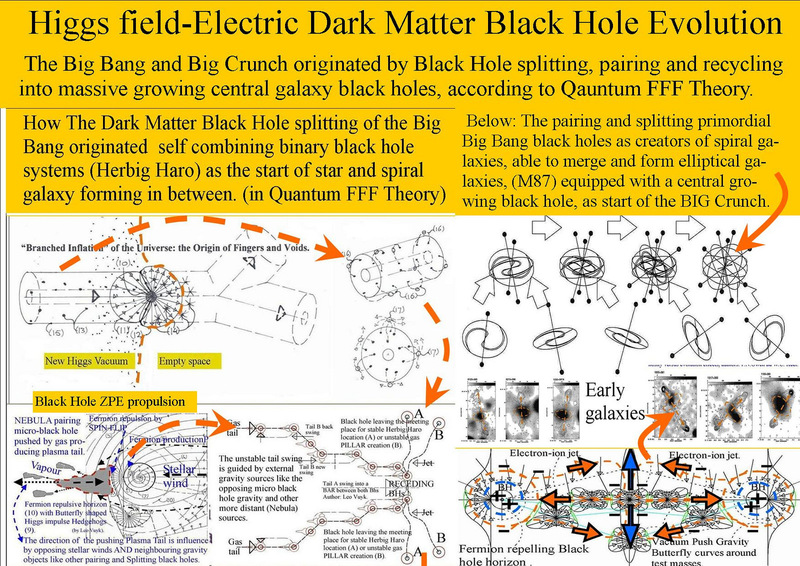 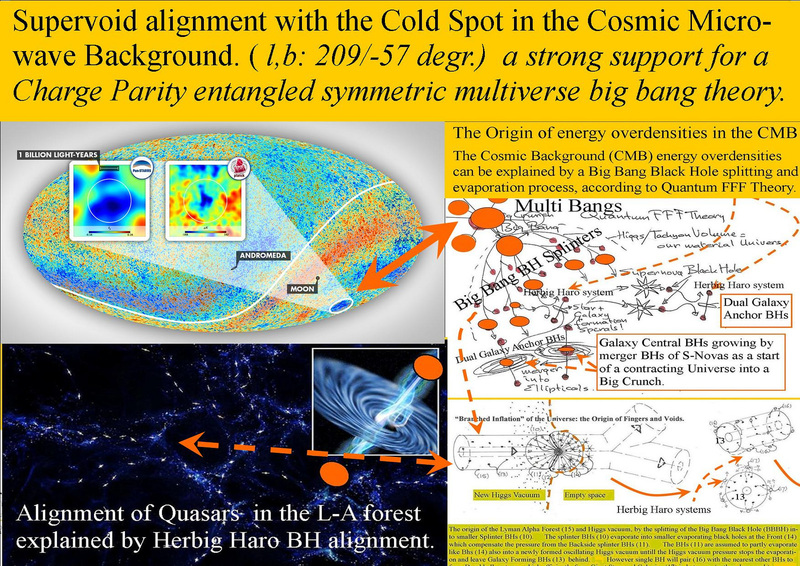 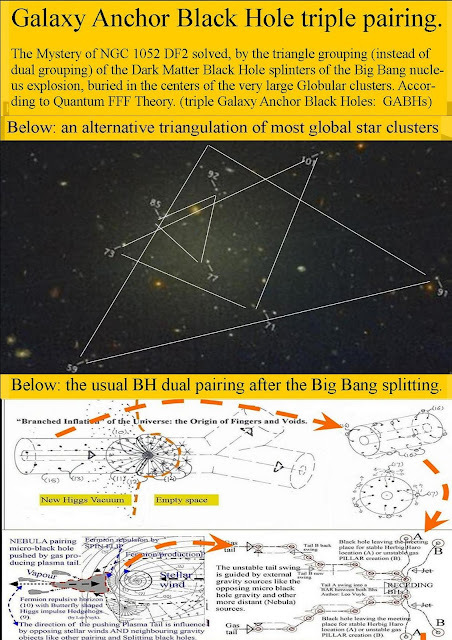 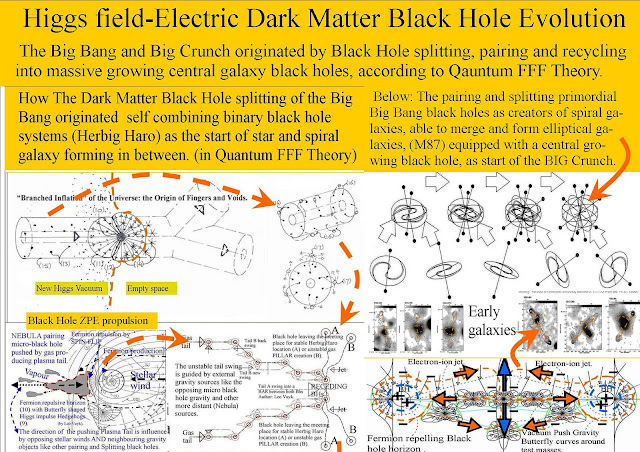 At the same time in the Quantum FFF model, it is proposed that early Galaxies also are created by dual black hole ( HH) systems being former Big Bang black hole splintered primordial dark matter black holes. 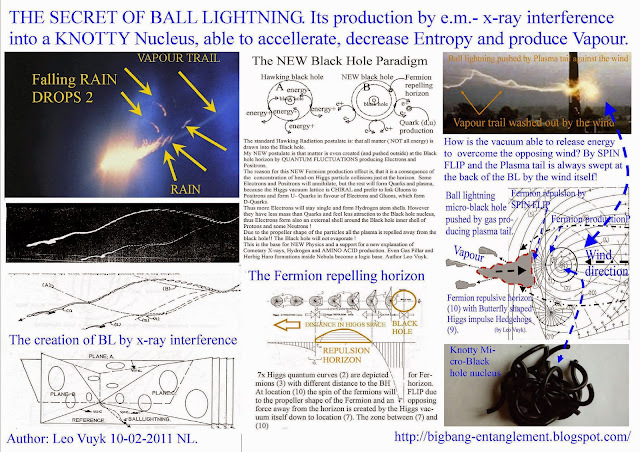 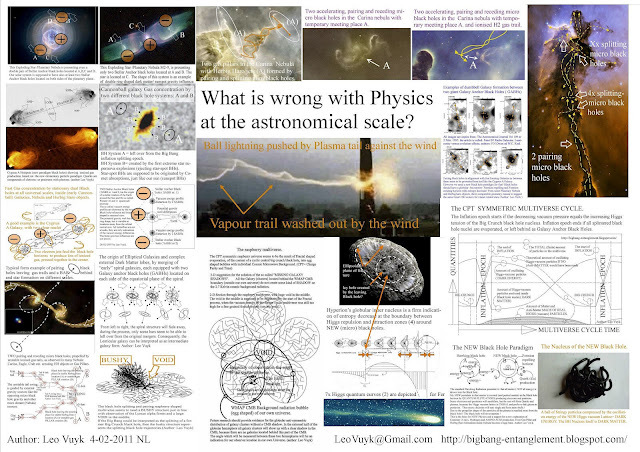 As a consequence, the standard Hot Big Bang with Hot plasma and Hydrogen as the base for everything has to be rejected. 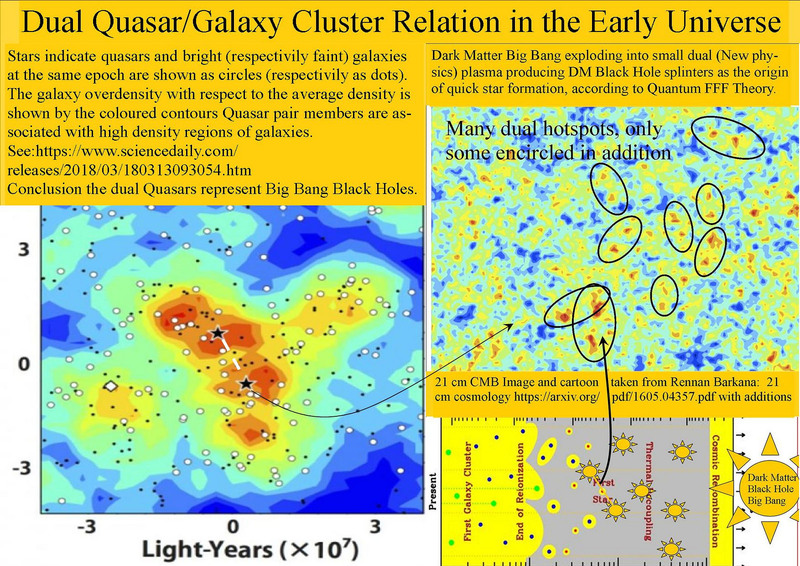 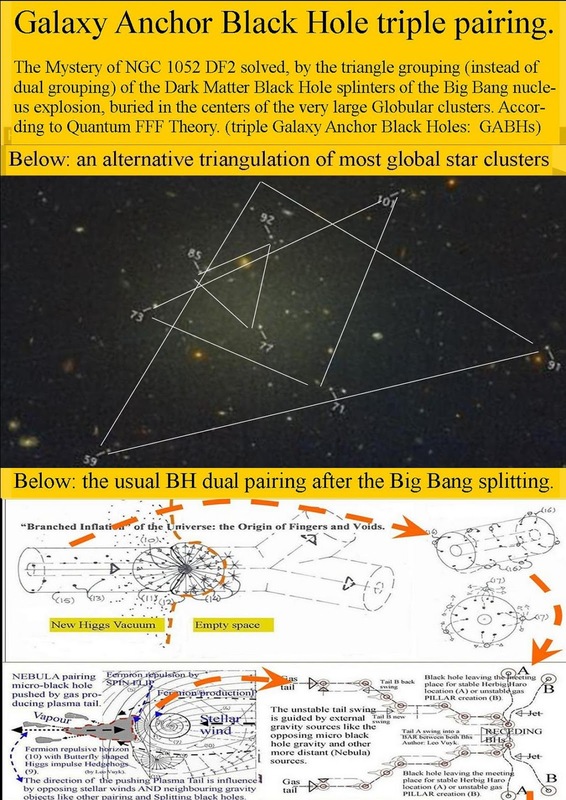 Recent observation of a faint galaxy without a dark matter content (NGC 1052 DF2) seems to be created by the star forming capacity even by triple pairing dark matter black hole nuclei of the surrounding globular star clusters assumed to have a triangular topology. The most exciting example of pairing and splitting HH black holes. 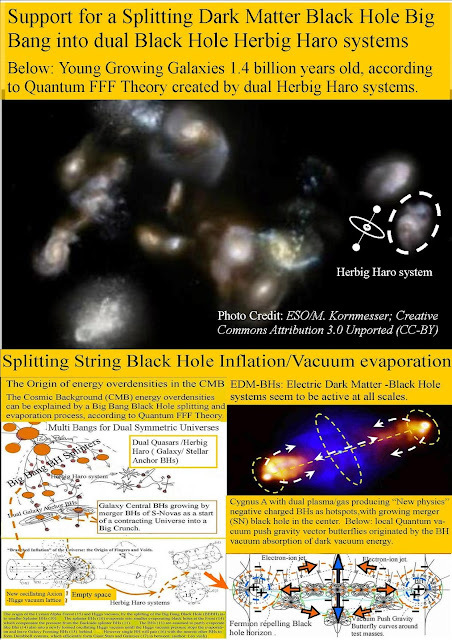 Since even dual Herbig Haro black holes have only vacuum pressure gravity and no mass or inertia, this curvature of the jets is the result of local baryonic gravity at the central young star, pushed into the direction of a local mass concentration. Other examples of Gas producing dual Black Holes: Cygnus A etc. 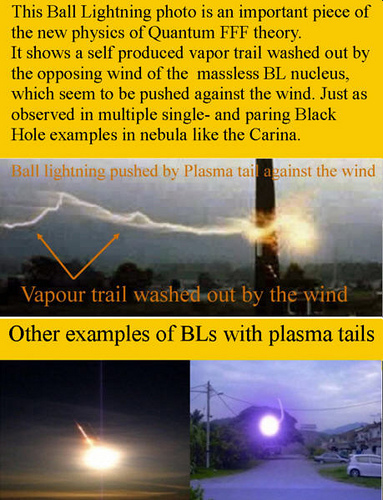 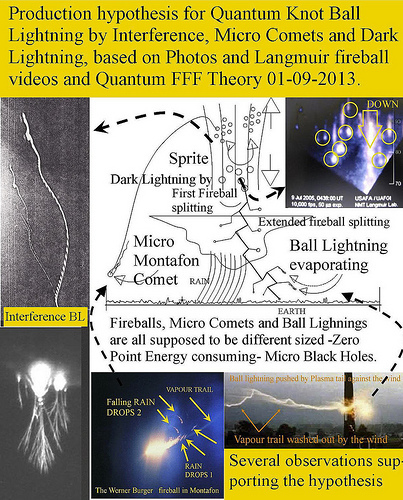 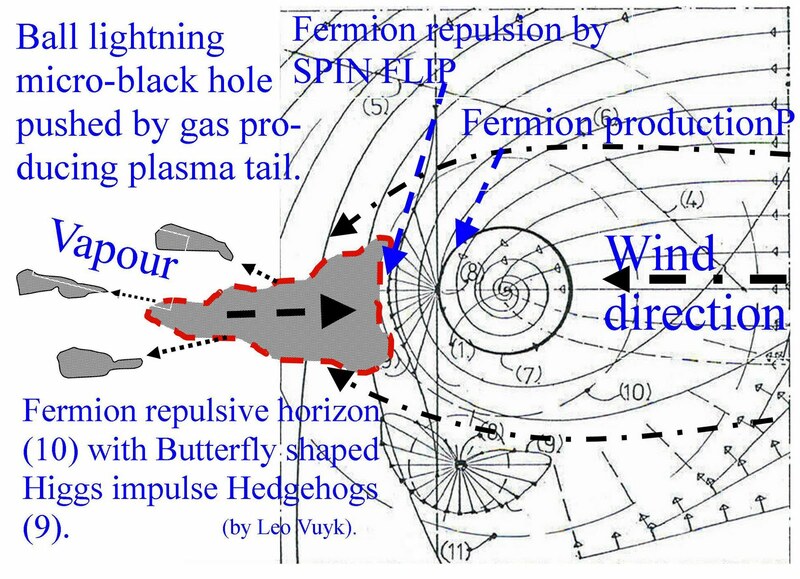 Earth bound examples of plasma tail propelling Ball Lightning / Micro Comet Black Hole. 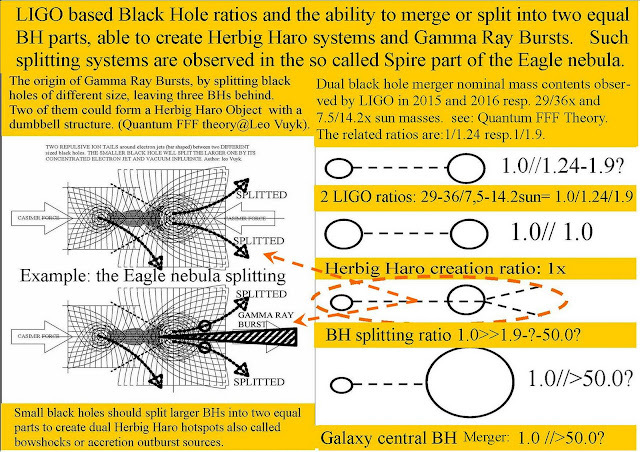 Spire splitting and pairing and splitting again,. 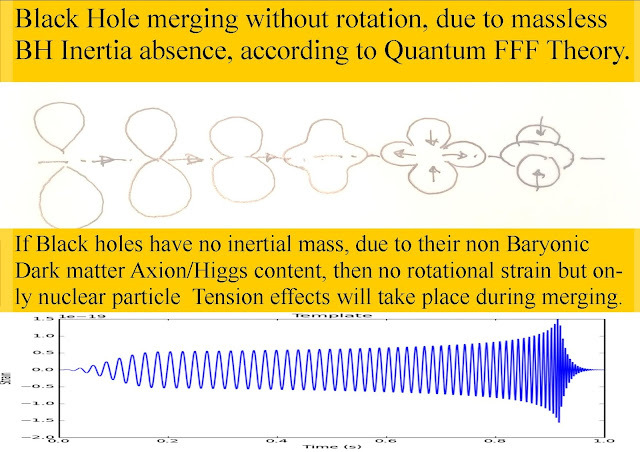 Non Rotational Black Hole Merger strain, with only nuclear oscillation effects. 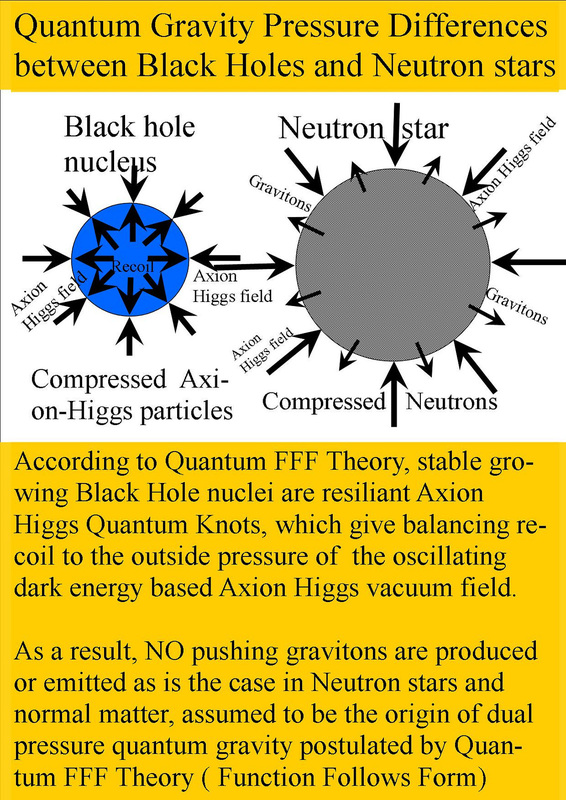 If Black Holes have no inertial mass, due to their non Baryonic Dark Matter Axion/Higgs content, then no rotational strain but only nuclear particle tension effects will take place during merging. 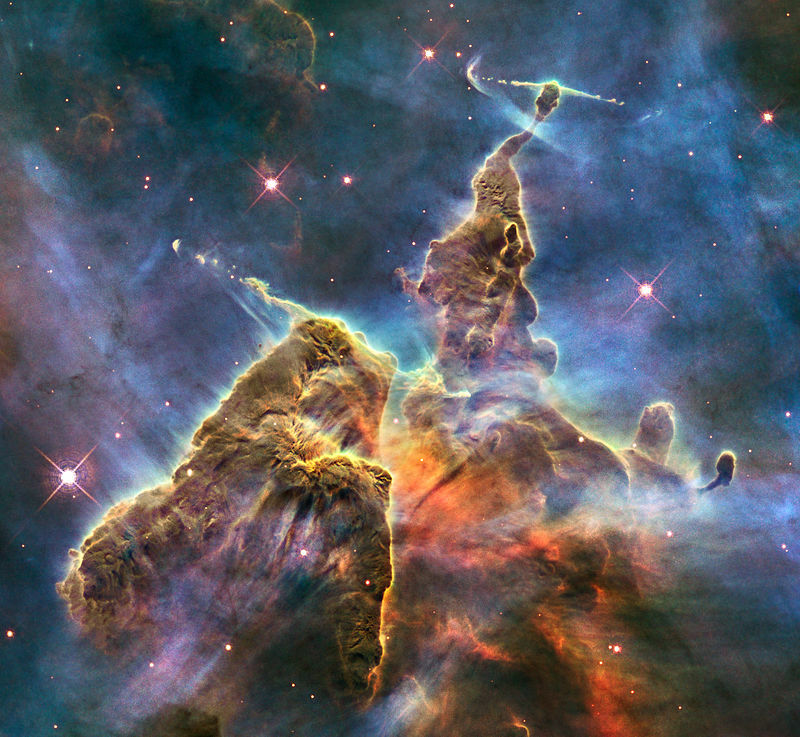 Neutron stars however have normal baryonic mass and consequently rotational based strain effects. (duration about 30 sec ) see below. Questions on Hubble Redshift relation with Universal Expansion by New Dense (Dark) Matter Cosmic Filaments and support for Splitting DM Big Bang. 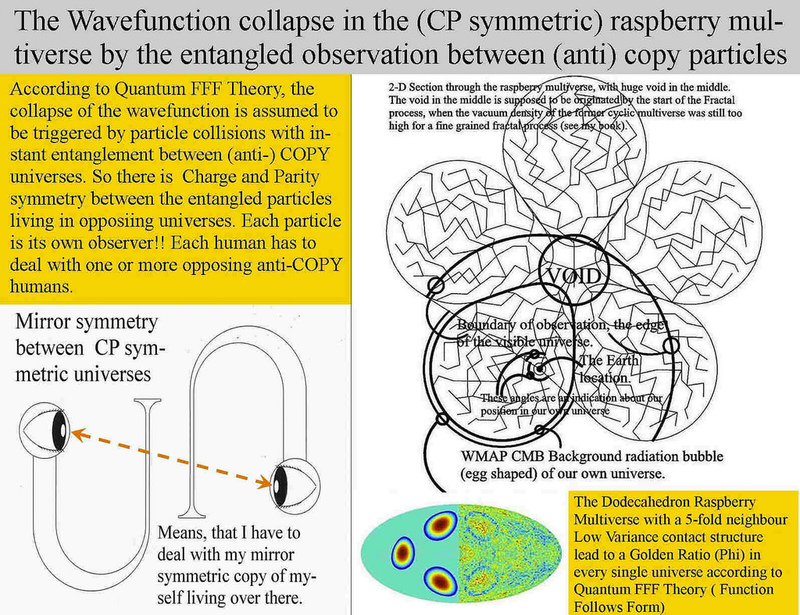 Universal contraction in the making, according to Q-FFF Theory. 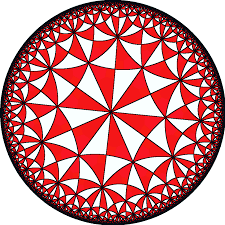 And a Cyclic CP (T) Symmetric Multiverse.